18 December 2012 – The Rolex One to Watch for December 2012 is awarded to Aleš Opatrný (CZE), who trains at JS Opatrný Hořovice (CZE). During the month of November, the 31-year-old jumped from 355th to 238th – a move up the Rolex Rankings of 117 places. Opatrný was born on 18 September 1981 in Hořovice (CZE), where he grew up on his family’s ranch, which has a 100-stable capacity and is situated approximately 60km south west of Prague (CZE). 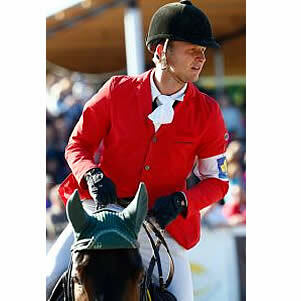 When he was two years old, Opatrný was introduced to riding by his father, Václav, who was a successful Eventing rider and triple champion of the Czech Republic. Equestrianism is unquestionably the Opatrný family’s main focus and they have been breeding horses as far back as 1924. Opatrný cites January 2012’s joint Rolex One to Watch winner, German rider René Tebbel, as the Jumper that he admires most and he believes Tebbel has been the greatest inspiration in his career. His drive to succeed stemmed from his memorable victory in the 2000 FEI Young Riders European Championship, Hartpury (GBR), which he won with his dark bay stallion, Kris Kentaur. Opatrný’s motivation is to one day compete for his national team at the Olympic Games and to also climb the Rolex Rankings as high as he possibly can.